1867 – A shark was seen by 2 or 3 people in the Upper Mary around the old coal mines but that was not believed by everybody because there was no way a shark would come that far from salt water. then in 1867 a 15lb young shark was caught at Pioneers Rest. 1870 – a monster shark was caught by Chinamen in the Mary River they had a fishing establishment and they say the shark weight in at around 200lb and was “an ugly customer if he had met anyone bathing”, but ” yielded a good quantity of oil”. 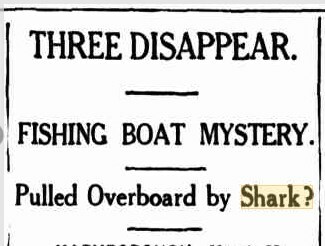 1878 – If you went missing in the river it was presumed you were taken by sharks as the river was teeming with them in 1878. The river was full of fish at this time and a number of aborigines were in the water at Inskip hunting mullet, when a shark made its appearance, there was a rush for shore and Master Shark was a little too quick for the man at the back of the bunch. The shark seized him by the leg in anticipation of a good feed but the fellow kicked and yelled and managed to escape with the loss of about a pound of flesh. Both lived to see another day. Two men were drowned in the river and their bodies were never recovered presumed death by shark. 1885 – Michael Marooney fell off an oyster boat in the river and with the aid of a rope and besides the fact he was an excellent swimmer he sank immediately. 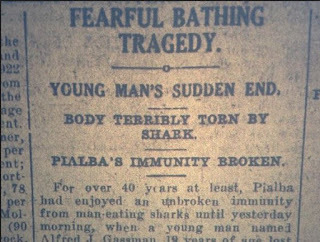 It was supposed he was pulled down by a shark. The steamer Balmain ran into the pilot cutter off the shores of White Cliffs Fraser Island and no body was recovered from the cutter due to the great number of sharks at the collision site. 1909 – sharks were sighted as high up the river as Hynes Sawmill. 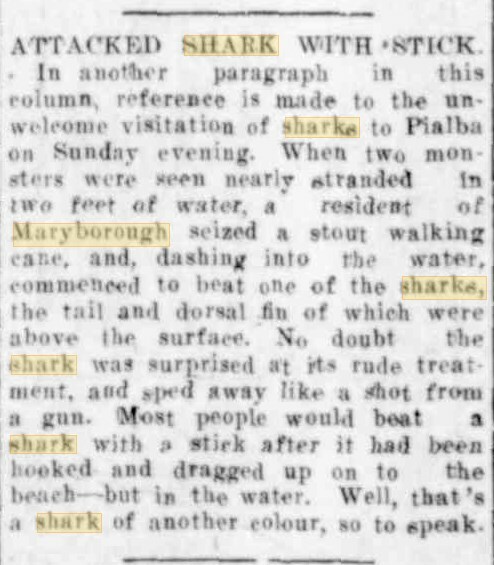 1910– “Escape from a shark” the headline read.. and the story goes that a Maryborough sportsman was rusticating (yes rusticating) on Fraser Island and was looking for dugongs when he found a huge turtle. So he decided a feed of turtle would be good and took a shot, wounding the turtle but when he examined his catch he realised the turtle had a large gap in one side, the shell was crushed like eggshell and him and the turtle were in shallow water. 1913 – This story tops it all.. Noakes and Wells were out for a spot of fishing for blackies and within a short time Wells hooked something. He quickly realised it was a monster and way more formidable than a blackie. So with all their strength and courage after the boat started swaying they decided to heave the anchor and hang on. The monster took matters into his own hands and took off for Woody Island towing the boat at a good speed and then returned toward the bay toing and froing through the water. This went on for 4 hours before the men were able to land the monster to find they had snared a large blue shark measuring 10ft and weighing over 600lb.. The men had a grand old day being tossed about the Bay and were quite delighted with their catch. 1918 – Mr Neilson was fishing off the Maryborough Pier and caught a huge monster on a big rope line. The shark was estimated to be between 12-15 feet, he never got to land it as it snapped the hook and made good its escape. 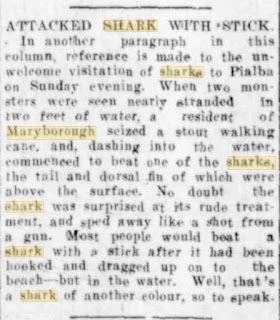 1919- A resident at Boonooroo had an exciting experience with a 6ft shark that whilst the resident and a teen were out rowing the shark took a dive at one of the oars, and it missed and struck the stern of the dinghy, the tail of the shark hitting the lad. The boat swung round and the boy was knocked off his seat into the middle of the boat. Thankfully after lots of loud, aggressive attempts the shark was frightened off. A 15ft hammerhead shark was caught in kingfish nets at Walkers Point in the early hours of the morning. The shark had broken through the net and got caught by the rope attached to the net and the rope formed a double hitch and held the shark by the tail. Alf Ramsay couldn’t land his catch even though it was well secured so a gun was used to finish the shark off and the tail was bought to Maryborough for display. C.C. Inman would often set a line in deep water outside the reef at Pt Vernon and found a small shark one day about 5 ft long dead and bitten right through. Then he discovered the dead blue shark on his line just under the surface. The shark was hauled in and measured in at 10ft long. In an article in a national paper Hervey Bay and the Sandy Straits were named the worst shark haunted waters on the coast of Australia. 1923 – January in Hervey Bay a time of many holiday makers, lots of swimmers.. and one large shark. This shark was sighted at half a dozen different spots in the Bay and was allegedly around the 6-7ft mark. Discussions were starting about shark enclosures after the first one was installed at Coogee beach. 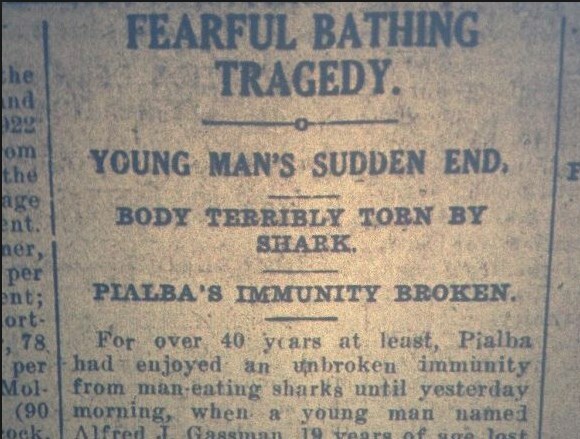 1927 – Man attacks shark with a stick.. 2 sharks were stranded in shallow water at Pialba and a gentleman upon seeing these ogres.. seized a stout walking cane, and dashing into the water commenced to beat one of the sharks. The surprised shark offended by the brutish treatment sped away like a shot from a gun.. article below. A Pialba resident set a line one evening and the next morning found he had hooked a 5ft 9in blue nose shark. 1929– Donovan and Mathieson returned from fishing at Snout Point with the jaws of a 14ft 5in White Pointer. The shark was caught using a dingo that had been previously shot at Tin can bay. and they had to winch it on board it was so big. Shark hunting became a sport and the most interesting story was when Bignall and Mr & Mrs Float went fishing they were anchored halfway between Pialba and Point Vernon and had dropped large lines baited with Mackerel. The first one got away but the second was a shark of two/three feet then the climax came when they hooked a grey nurse of 9ft. 6in. It took the 3 of them quite a time to tire the shark and they then towed it into shallow water where one of the men with the aid of a tomahawk dealt the shark a few stunning blows. Sharks were seen by now crossing outlying sandbanks and hunting for a good meal. 1930 – The waters surrounding Boonooroo abound in sharks but they rarely come into the shallows of the flats. Although in March 1930 a 14ft long hammerhead was sighted swimming in the shallows.. there were bathers in the water at the time and tragedy was averted by the distraction of a stingray..
1931 – Rickard & Boswarth two blokes who were canoeing from Brisbane to Rockhampton in a canvas canoe and found they had a stalker when they left Maryborough. There was at the time a shark which had been named “Jerry” by seamen and he was reputed to be around 23ft long. Jerry stalked them during their journey and they even decided to head into shore at one stage and wait for a few hours but when they recanoed out Jerry was waiting for them. He never attacked them maybe they weren’t to his taste..
1933 – A dead 60ft whale was seen floating near Moon Point so the fisheries inspector towed the whale to Little Woody Island so it would not obstruct the shipping lanes. The whale was followed by hundreds of sharks and after the whale was beached fishermen took advantage of the moment and baited a line or two and where successful in hauling in a few.. the more daring fishermen shot at the sharks while they tore the whale to shreds. 1935 – RACE FOR LIFE WITH SHARK … A man who was swimming out to a dinghy anchored off the beach at Scarness was warned of an approaching 12ft shark. He was hotly pursued by the shark so close the shark actually stranded itself in shallow water. 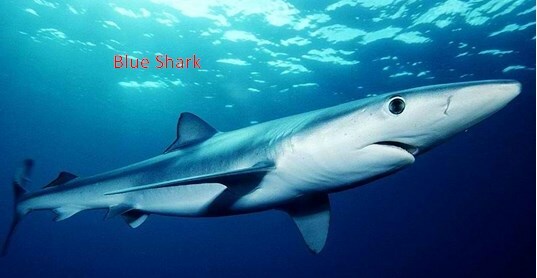 1936 – A 6ft blue shark was landed at the Wide Bay Rowing Clubs pontoon and the lads thought that was a great haul but sadly the big one got away and they never saw how big that one was as it took the line and bait with it. George Sterne landed a 13 foot tiger shark off Inskip Point in 1936. Geore was in a 10ft dinghy in about 100 feet of water and he had a half hour battle to get the shark in the boat.. The stomach contents included large pieces of turtle shell, a sea snake 6ft long, 20 empty mudcrab shells, 20 empty sand crab shells, 2 tins full of swans feathers and other rubbish of a stinking nature. Young & Sempf decided on a days fishing off Pialba and were gifted a 14ft grey nurse shark which they eventually stranded in shallow water. The had baited a large line with two hooks and two live parrot fish as bait. It worked they got the shark and after a 2 mile towing, and a couple of hours they managed to get the shark to shallow water and several onlookers assisted, with one helpful bloke bringing the rifle. 1937 – Fishing was plentiful off the Urangan jetty and Wendland from Bidwell brought in a 32lb horse mackerel, but her most interesting catch was the 3 foot tiger shark caught in the same spot. An anchor rope attached to a line and buoy that was set just outside the bathing enclosure at Torquay was in no way going to stop the 18ft tiger shark that was roaming the shores of Hervey Bay. The shark broke the rope and was actually embedded in the sharks mouth with the empty drum attached and the buoy was sighted several times and fisherman pursued the monster but couldn’t catch it. This monster evaded capture and for a time after there were at least three other large tiger sharks caught in the same areas.. the largest being 12ft. The 12ft tiger shark was caught off a baited line attached to a buoy off the beach at Torquay. The buoy was far enough out the men got a chance to partially drown the shark while dragging it into shore. Inside the shark was a bone about 2 ft long and 12in. in circumference presumed to be a piece of backbone from a small whale. The shark nets were being tested by a large shark that would swim at the back of the enclosure and touch the wires, then turn sharply and disappear from sight. 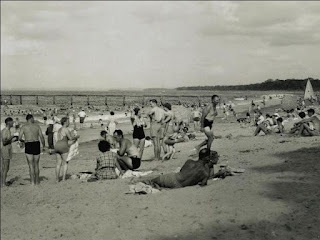 The shark net at this time was in a bad state of repair and Miss Sinclair and Miss Kinne were in four feet of water swimming when the sighted what is to be believed to be a 12ft shark that was not trying to get through the hole but merely slowly swimming along the barrier. A 9ft shark caught by Messers Fleming and Torrens was dragged up onto the beach where it disgorged a 2ft grey nurse shark. Four blokes went fishing at Moon Point and at some time during the night three of them disappeared, with no evidence of what happened. A fortnight later a Boonooroo fisherman found a 10ft tiger shark with 20 feet of cod line attached to it. 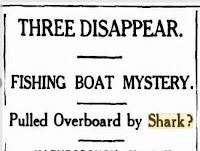 The shark was tangled in mangroves off Walsh Island 15 miles from where the blokes disappeared. The shark died from drowning and was dead when it was found. No sign of foul play and there was a 14lb cod in its stomach. 1940 – Neilsen landed a 11ft tiger shark near Urangan. The shark put up a great fight even towing the dinghy quite a distance. Another shark of around 8 ft was also caught by Neilsen. and it was so unimpressed it even tried to turn over at one stage and remove the spear. 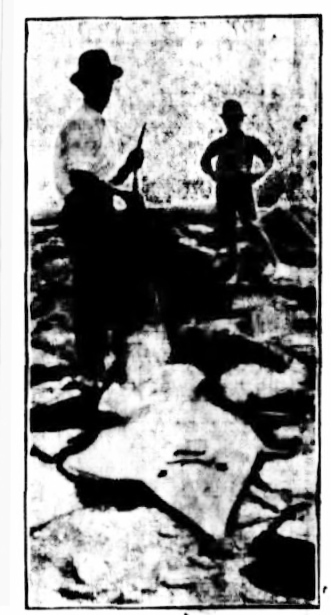 A long line attached to the spear allowed Geisler to walk up and down the pier to tire the shark out and bystanders did their bit by making noise to frighten the shark every time it tried to swim under the pier. In the meantime Rayner returned after going home to get a heavy harpoon with was spiked into the sharks back and the 2 fisherman then restrained the shark until the tide was low enough for them to retrieve it but the shark was intent on escape and struggled free and swam off but not without fisherman expressing the view the wounds would attract cannibalistic companions that would make short work of the injured shark. An 8ft tiger shark was caught by Knight at Urangan. 1942 – a lad saw a 5ft shark lying in the shallow water at the jetty and he actually speared the shark. The spear stuck and the shark took off, the lad unable to hang on to it. So the shark dissapeared with his spear and it just so happened the same lad was playing near the Torquay rocks the next day and found the missing shark washed up dead with the lads spear still in it. Godfrey and Foster were out fishing off Pialba and after two hour hooked a 10ft grey nurse. which took them about 1 1 /2 hours of free riding around the bay before the shark tired and was dragged into shore. The shark was caught on a 10lb cod which it swallowed whole. 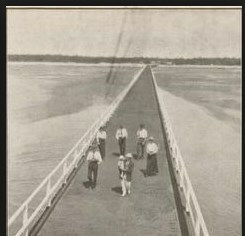 Baynton & Gottwald were trailing a rope off Round Island and Urangan gutter when they got the wildest surprise. A monster shark fought them for about 2 hours before it finally gave in and it was a blue nose that was 15ft. long, weighed approx 1/2 a ton and had 30 young sharks in her belly when they sliced her open. 1948 – Neilsen had been watching and planning his attack on the 9ft Tiger shark that he knew was trawling the waters off Torquay. Neilsen and his mate Anderson decided to set a trap for the monster and they baited it with an ox heart. The snaring of this monster took a couple of goes over the Christmas holidays and on the day they got him.. they had found the shark securely hooked and thrashing violently in the water. So they decided to half drown the monster before anything but the shark found fresh energy and was up for another fight After hours of battling this monster the shark finally tired and they hauled him high and dry for everybody to see. Police stated that shark was the first seen in the vicinity in a long time. SHARK REPELLENT FOR SCOUT CAMP… Shark repellent was used by 800 scouts while they were on a camping adventure on Fraser Island. The shark repellent being an area roped off and bags of shark repellent – copper acetate was strong along it at short intervals … the experiment was successful all 800 scouts lived to tell the tale. Bathers at Torquay were treated to a 12ft shark chasing a stingray into shallow water.. actually within 20 yards of the shore where it stranded itself temporarily before thrashing about for 5 mins and then disappearing. 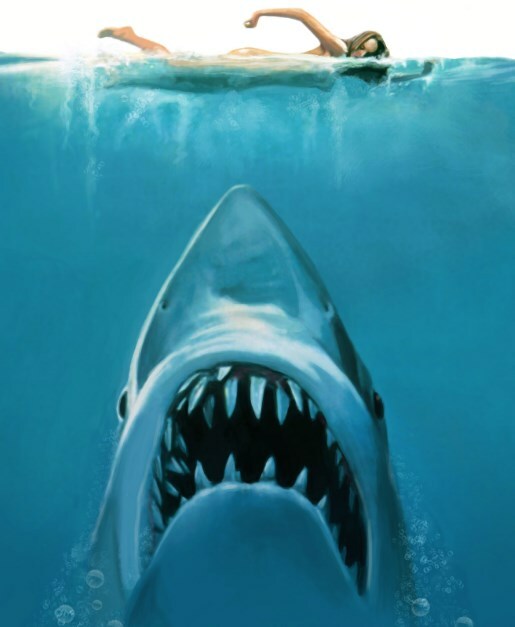 .. “Sharks are seldom seen in Hervey Bay waters”… seriously …this was the quote in the newspaper article. 1952– A 5 ft shark terrorized a family and came within 15 yards of the waters edge just a few feet away from where their son was wading.